The St. Albans Messenger website features a photo of new owner Jim O'Rourke. Emerson and Suzanne Lynn, the owners of several local newspapers in Chittenden County, are selling the St. Albans Messenger. The buyer is Chicago-based publishing executive Jim O’Rourke, according to a story posted on the Messenger's website. The announcement did not disclose the terms of the sale. Emerson Lynn bought the paper, which publishes six days a week, in 1981. His company, the Champlain Valley News Group, is based out of the Messenger offices in St. Albans. 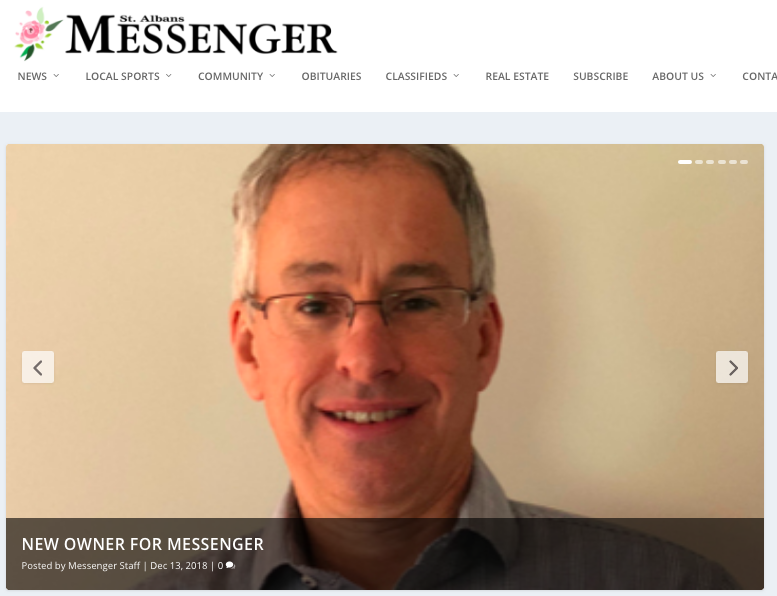 The Messenger's announcement on Thursday did not explain why the Lynns decided to sell the paper, though it says that Emerson and Suzanne will continue their jobs there as editor and general manager, respectively. The story also did not address the future of the three remaining newspapers in the Champlain Valley News Group — the Essex Reporter, Milton Independent and Colchester Sun. The Lynns and O'Rourke did not immediately respond to requests for comment Thursday afternoon. According to the Messenger, O’Rourke lives in the Chicago area, where he's been an executive at World Book, a subsidiary of Berkshire Hathaway that publishes educational materials. He also spent two years as president and publisher of a group of Michigan newspapers owned by Digital First Media. Before that, O'Rourke worked for GateHouse Media from 2006 to 2012. O’Rourke has some experience in Vermont, according to the Messenger: He was circulation director for the Burlington Free Press from 2003 to 2005. Lynn's brother, Angelo, is also a player in local media in Vermont; he owns the Addison Independent, Brandon Reporter, Killington's Mountain Times and Vermont Ski + Ride magazine. Vermont’s rapidly evolving media ecosystem is increasingly dominated by nonprofits: Vermont Public Radio, Vermont PBS and VTDigger.